I've been on a bit of a kick lately with books about books, it seems. First Shadow of the Wind, then The Thirteenth Tale, now The Yellow-Lighted Bookshop. To be fair, though, all three books were gifts; clearly my friends and family know me well, because I've enjoyed every one. 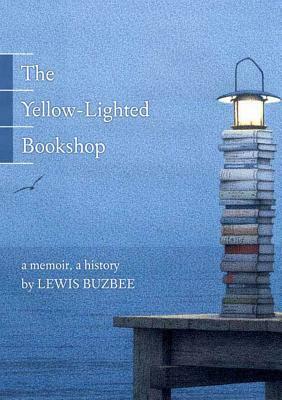 The Yellow-Lighted Bookshop is, as the subtitle suggests, part memoir, part history. Author Lewis Buzbee has spent his entire career in various corners of the bookselling industry: store clerk, publisher's rep, author. He draws just as heavily on anecdotal evidence as historic fact in his presentation of the course of the bookshop throughout our history. Beyond memoir and history, though, Buzbee's book is a collection of trivia about the bookshop. Did you know, for example, that before the printing press, it is estimated that there were only 50,000 books in all of Europe? That's books, not titles. 50,000 in comparison to the 20 million estimated a mere 50 years after the first Gutenberg Bible was produced. Or how about the names of various pieces of those precious books that line your shelves? The right page is the verso, the left the recto. The groups of pages found in a hardcover are called signatures; when paperback pages are cut flush and glued to the spine, this is called perfect-binding. Gives you a new appreciation for all that publishing lingo, don't it? It seems to me that that is part of Buzbee's plan, here. He notes that the novel has died, books have died, and now, at the dawn of the e-reading era, there are those that make the case that reading itself is dying. Bookselling is certainly on the decline; one indie is closing down after the next. But amidst all the bad news, Buzbee finds the silver lining: there are new bookshops opening. There are avid readers who will never give up the paper pages they hold in their hands. There are people like you and me that get absolutely giddy at the prospect of a book about books; we keep authors like him and publishers like his going. In the face of over 150,000 new titles published per year (that's 411 per day, for those not willing to do the math), we sift through our options to find something that will engage us. For the record, Buzbee points out that that is 50,000 more titles per year than the entire collection held at the library at Alexandria. Per year, readers. But do not despair, for that is why we have our trusty booksellers to guide us, selecting titles for feature tables, face-outs, hand-selling. And on the question of the internet and its threat to these very booksellers? Ha! I knew I wasn't alone in my love of the smell of books. Now I have proof in the comments of others on my blog AND in Lewis Buzbee's commitment of this sentiment to paper. Note: All page counts refer to the paperback edition. It even has a lovely cover. And that quote from page 207 about a book smelling right? So true. My boss suggested I read it as well, and it does sound very interesting. I too love books about books. Have you read A Novel Bookstore by Laurence Cossé? Or Penelope Fitzgerald's The Bookshop? And 84, Charing Cross Road? (I think you might have already seen my review of that, or read the book)? Oh good! A book about books - love them. And, the smell of books is a distinct and comforting scent - I like ebooks for the convenience, nothing replaces the sensation of holding a book and turning the pages. What a great review! Really. This sounds like a book I should really read. I want to learn about the history of books and as much as I can about publishing. Thanks, Kerry! I'm reading Pat Conroy's My Reading Life and loving it right now, but it looks like this one might be a nice follow-up to that. I loved this book! It's one of my favorite bookish books. Trish - It is, all around, a lovely little book. I love paperbacks with French flaps, too. Steph - Oh! You have to read it for yourself, too, and THEN keep getting more as gifts. I haven't read the others, though I've had my eye on 84, Charing Cross Road for ages now. Ann - I know exactly what you mean. I appreciate the convenience of e-books, but then I miss my paper pages! Brenn - Thanks! It's a really easy read, but lots and lots of trivia and info packed in. I think you'd like it. Indira - I do the same thing. Seriously, this blog has been wonderful in many ways, and one of them is learning how many other people are ga-ga for the smell of books. Softdrink - It is fun, isn't it? Thanks for stopping by!